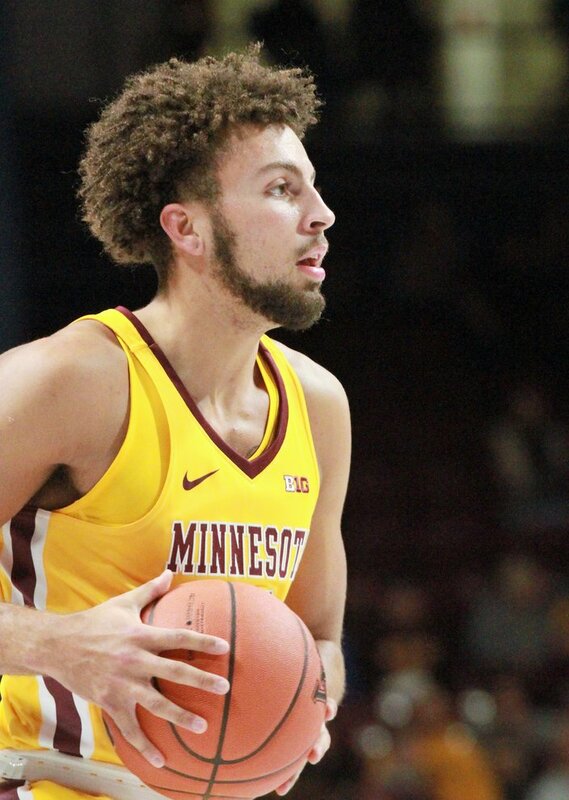 Freshman guard Gabe Kalscheur scored a game-high 24 points Thursday, including 15 on three-pointers, to lead the University of Minnesota men’s basketball team to an 86-76 victory over Louisville in the first round of the East Regional in the NCAA tournament. The Gophers (22-13) will play in the second round Saturday afternoon in Des Moines against Michigan State, the number-two seed in the East Regional. Michigan State defeated Bradley 76-65 Thursday. When the Gophers learned on Sunday they would be playing Louisville, the buildup of the game was overshadowed by Gophers coach Richard Pitino and his father, Rick Pitino, who coached Louisville for 17 years. Rick Pitino was fired from Louisville in 2017 for alleged recruiting violations. Thursday’s victory for the Gophers was their first NCAA tournament win in six years. The win is considered a mild upset, since Louisville (20-14) was the No. 7 seed in the East Regional. The Gophers were seeded 10th. Kalscheur, who made 5 of 11 three-pointers, was one of three Gophers starters scoring in double figures. Guard Amir Coffey and forward Jordan Murphy each finished with 18 points. The Gophers pulled away from Louisville (20-14) midway in the second half when Kalscheur scored nine straight points, six coming on back-to-back three-pointers by Kalscheur. Kalscheur’s hot stretch gave the Gophers a 62-43 lead with 9:48 remaining in the second half. Ray Richardson is a contributing writer for the Minnesota Spokesman-Recorder. He worked 34 years as a sportswriter for the Chicago Daily Defender, Phoenix (Ariz.) Gazette and St. Paul Pioneer Press. Richardson can be heard on KMOJ-FM 89.9 (www.kmojfm.com) as host of ‘Back In The Day,’ a popular R&B oldies show that airs Sunday nights 6 p.m.-10 p.m. CST.